THE NATURAL HAVEN: Before You Shampoo: Conditioner or Oil? Before You Shampoo: Conditioner or Oil? Browsing through forums, vlogs and blogs, hair care can rapidly get complicated. I am all for simplifying your routine and making hair care more pleasurable! So, should you go for an oil or a conditoner or a conditioner oil mix? Well let us see what you get with each! 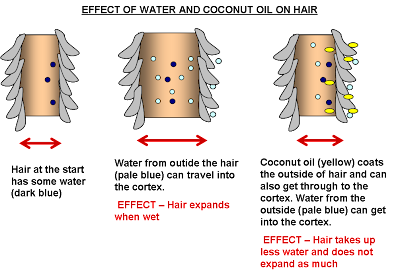 Role 1: I have previously talked hair damage caused by hair expanding when wet then contracting again when dry (hygral fatigue). Certain oils like coconut oil and olive oil are known to penetrate slightly under the cuticle and help reduce the expansion of hair when wet (J Cosmet Sci, pp 169-184, 2001). Role 2: Shampoos work by lifting oil off from the surface of hair (see diagrams here). However for some people this leaves the hair feeling stripped. A prepoo treatment with oil is essentially creating greasy hair. Greasy hair usually means that one shampoo application will still leave some oil behind. This little bit of oil allows hair to not feel 'stripped'. Words of caution for Oil Prepoo - Not all oils can prevent or reduce hygral fatigue. Oils require several hours to penetrate the hair. Some people have naturally greasy hair and will not like the feel of extra oil on hair. Role: Conditioners have a high component of water (usually over 50%). Applying a conditioner or a conditioner oil mix to hair prior to shampoo is therefore unlikely to be as effective in reducing hygral fatigue compared to an oil on its own. However there is no research on this at the moment. The principle role of conditioner applied to hair prior to washing is to create a greasy layer similar to role 2 above. Words of caution for Conditioner Prepoo - Build up can occur as a result of the different charges in conditioner (positive) and shampoo (negative) (J Soc Cosmet Chem, pp 263-278, 1993). Wherever possible rinse out the conditioner thoroughly before using the shampoo. Applying one directly over the other can create build up. thanks this was very informative!! when i used conditioner as a prepoo i neva rinsed out the condish before i shampooed. "Applying one directly over the other can create build up." For the longest time I thought I was imagining the build-up that was developing on my hair whenever I pre-poo'ed with conditioner, but you scientifically confirmed it's possible. Thanks! You have THE best hair info blog. I like coconut oil for pre-pooing! I've often wondered about this JC....thanks for the timely post! My routine is very simple and I do not employ the "prepoo". However, it is nice to know the outcomes of both processes. In the near future, I will put both of these to the test to see if either makes a difference on my hair. Neems - Nope it is not imagination.The interesting thing though is that some shampoo and conditioner combinations will cause build up issues but others won't. Therefore shampoo A with conditioner B may cause build up but the same shampoo A with conditioner C may not. Unfortunately you cannot know until you actually try which is why it is best to avoid the issue altogether and just rinse in between. Ok, JC, now I´m confused. I do both methods. Once a week I put oil in my hair and leave it on over night and once a week I pre-condition my hair. What about the oh-so-praised CWC (conditioner-wash-conditioner) method?? I thought the conditioner was there to protect my lengths and ends from harsh ingredients in my Shampoo?? Are you trying to tell me this is complete nonsense? For conditioner pre-pooing, I'd suggest using the same brand shampoo and conditioner to avoid the build-up issues. It's likely that most manufacturers formulate their products so that they can work well together. I pre-poo with conditioner only which for me is also a detangler. I've found that breakage is minimised when I detangle before washing. I'm sure pre-pooing with oil is great for some, but I often feel like I'm wasting the oil. Cubelixa - Both methods (i.e oil or conditioner) are valid in terms of preventing the stripped feeling that shampoo can give. Conditioner however is not known to do additional things that oil can (for example preventing hair expanding too much when wet). I honestly do not understand the reasoning behind the deep condition - wash - rinse out condition method. As Mellowyel said many companies do encourage it, Carol's daughter is one and Aubrey organics is another. For those who deep condition with the intention of getting more of the conditioner to stay on the surface of hair (through more time or heat or both), it really does not make sense to me to shampoo all that off and then re-condition. However........if it works for you then keep doing it. Ultimately your hair is your own guide. How interesting! I pretty much always "pre-poo" with coconut oil, mainly because it helps me when I'm doing a light finger detangle and sectioning for my shampoo. I really do it just because the coconut oil helps provide lubrication (and I just love the smell!). It's nice to know that it may be legitimately helping protect my hair some, too. Thanks, Jc! Great post! Personally, I think pre-pooing is weird. I have done it before but, I don't like the idea of putting more product on already dirty hair. Essentially, you are making your hair more dirty or product heavy so that some dirt or product is left behind. It's like putting on lotion before you take a bath...counterproductive. IMO. I would just shampoo & condition and then do a deep condition to restore moisture if my hair was stripped. Great post! I am a huge advocate of deep conditioning prior to washing with AOHSR. During Loo's challenge I switched up and pre-poo'd with coconut oil some times, however my hair didn't feel as soft, and the detangling was much more difficult. I think the method for me plays a duel role in making my hair more manageable and also temporarily replenishing that which is lost. Another thing - I think I've had some SERIOUS product build up in the past due to the shampoo/condition without rinsing method. I recently started using a different shampoo and haven't noticed the build up. Great point to add with regards to product incompatibility being a cause of this build up. This could also be a major contributor to my poor, dry scalp. I definitely learned something! I've always used Suave's Coconut condish with Evoo or Coconut oil. I've always felt like it helped me detangle my hair, soften it, helping me to remove shed hairs before co-washes. So I'm not sure if I thought it actually benefit my hair pass the prepoo stage? But this has peeked my interest. I'm going to start pre pooing with just my coconut oil the night before to see if it helps past the prepoo stage. Thanks for your answer JC. Can the build-up problem be avoided by using matching products (same brand for shampoo and conditioner) as Anonymous said? Thanks all for all the comments and contributions! DIY hair care - lol! Yes a prepoo is like making your hair dirty before you wash it and hoping to leave some of this dirt behind. The difference is that the dirt you put on is 'good dirt' lol. 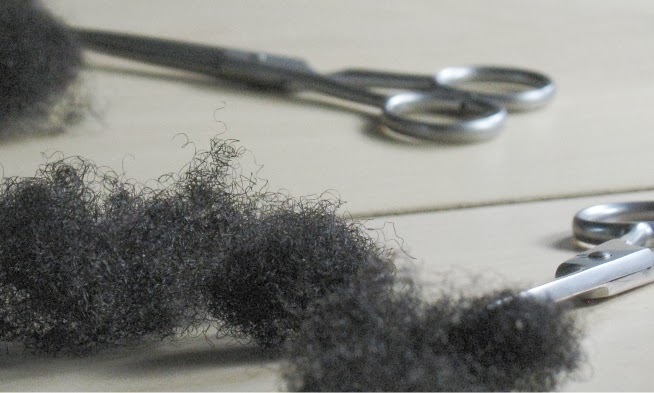 Mo - have you ever tried doing it the other way, like prepoo with a conditioner, wash then deep condition with AOHSR? Just wondering if your hair would feel the same compared to deep conditioning first. Cubelixa - I do not know if using the same brand would avoid the problem. It is more a question of chemistry and I could not possibly give an answer because there are so many different product combos out there! I think the best way to avoid build up is simply to rinse off between each stage and in the event that it is still present to change one of the products that you are using. So adding a little conditioner to the hair before rinsing out the shampoo to prevent the "stripped" feeling can lead to build up as well? J - Yes, the direct mixing of shampoo and conditioner can create build up. I like coconut oil too, but I don't sleep well and find it even more difficult to snooze away in a cloud of coconut. Gerlinde - olive oil is suggested to have the same properties as coconut oil based on its composition. I personally almost always (99%) go for coconut oil. I did olive oil once but it was too messy for me and I did fall in the bath too (not really the oil's fault, I sort of have two left feet). I do switch up to shea, castor or avocado butter somethimes but not as a pre wash. Pre wash is always coconut for me. I use a mix of oil and conditioner before shampooing my hair but I mainly use it for detangling, not necessarily as a prepoo. I also try to rinse all of it out before shampooing. I don't care if my hair feels stripped after I wash because I'm going to use a rinse out conditioner, then a leave in. I've found that my hair feels too oily if I don't rinse it completely then put more product on it. Are there any other oil that prevent Hydral fatigue? I read in an article that Babassu oil has the same properties as Coconut oil, what do you think? Coconut oil has a tendency to make my hair feel dry and crunchy when I've applied it to my ends. Do you know if this would still have the same effect if I use it as a pre poo? Also would adding ingredients such as honey to the oil provide any extra benefits or take them away? No wonder i get so much darn build up no more conditioner pre poos for me ( i do it more for detangling purposes), i'll tell my sister too. When i use coconut oil i wet my hair a little before applying it, is that ok? JC, how long do you leave on coconut oil as a pre treatment? Napptural Triplet Mum - Try reading the fingertip coconut oil recommendation (just search the blog). The crunchy feel is sometimes due to using too much or weather related as coconut oil gets harder in cold weather/air conditioning. Anon - Coconut oil is the only known and researched oil. Olive oil has been suggested due to composition in a scientific paper. Castor oil, babasu oil, argan oil have not been shown to penetrate hair (i.e the research has not been done). I don't why I didn't commit on this blog before but I have to say your explanation of the prepoo method is GREAT!!! I love your blog and I wanted to say keep up the good work! I used to Prepoo all the time with Coconut/olive oil and for some reason, laziness has taken over and i stopped lol. Using olive or coconut oil really DOES make a difference..
What about doing the same treatment with silicon containing serums?. Dimethicone can also reduce hygral fatigue right?. Thanks so much for this post! Im looking into this pre-pooing myself and just bought some Almond and coconut oil from the indian store to use as a pre poo before my ayurvedic application tommorow. I have done the pre-poo and all it did was make it less dry and oil dripping all over the place. I gave it a try, it was ok. I have tried putting olive oil in my hair overnight and putting a plastic cap over my hair. When I washed the nest morning my hair felt so soft. Now this pre-poo treatment is ofter part of my routine. Thanks Adelina, I have actually referenced that article several times on the blog! That particular journal is packed with plenty of hair science articles, isn't it!! I always wondered about whether or not prepooing was effective. I used to prepoo with only oil, but then I switched to a conditioner with oil. Now, I use a greek yogurt recipe that includes apple cider vinegar and my hair loves it. The recipe acts as natural detangler and it's awesome! Thanks for the insight on this matter. It's very enlightening. Hi, I just found your blog. I've been natural for 10 years but only now realise that there is a large natural hair community out there. Now I can finally do this thing right. My question is.. after reading this article and the ones where you explain about pH and its efect on the hair...wouldn't it be correct then to say that in the pre-wash and washing stages that one should use a "substance" which would open the cuticle to allow the hair itself to get clean, ie something with a higher pH, then in the conditioning stages and daily routine use something else which would close the cuticles ie lower pH? Secondly, if I am making my own mixes at home does EVERYTHING need to be pH checked and if so how does using vingegar or baking soda to get to the "correct" pH affect the hair itself? I thank you for answering...waiting with bated breath.